Bornean Sun Bear Conservation Centre (BSBCC) is the latest attraction at Sandakan. The centre is located at Sepilok just next to Sepilok Orangutan Rehabilitation Centre. There are currently 33 sun bears at the centre and most of the bears are rescue and confiscated from all around Borneo Island. Sun bears are the smallest and least known members of the bear species. Their populations are rapidly diminishing in Southeast Asia. Habitats are being destroyed by deforestation and sun bears are being brutally killed for commercial exploitation. sun bears are one of the cutest young animals in the world. After their mothers are killed, they are captured as pets and are locked in tiny cages. This is where, as they grow, life in hell begins. The mission of the Bornean Sun Bear Conservation Centre (BSBCC) in Sepilok, Sabah, Malaysia is to rescue these captured sun bears, promoting sun bear conservation in Borneo through animal welfare, conservation, rehabilitation, research and education - to put a stop to these cruel practices. There are currently 33 rescued bears living at the BSBCC. Sadly, many of them have already spent too many years locked up in cages and their distress and suffering is clear. But, day by day, we strive to improve their lives and eventually introduce them to the forest once again. In Borneo, Sumatra and Peninsular Malaysia, tropical evergreen rainforest is the sun bear�s main habitat. This habitat receives high rainfall which is relatively distributed throughout the year and includes a wide diversity of forest types including lowland dipterocarp, peat swamp, freshwater swamp, limestone/karst hills, hill dipterocarp, and lower montane forest. In contrast, sun bears in mainland Southeast Asia live in habitats with a long dry season (3�7 months), during which rainfall is low (less than 100 mm per month) and forests are semi-evergreen, mixed deciduous, dry dipterocarp, and montane evergreen forest. The range of sun bears here overlap that of Asiatic black bears. Sun bears also have been reported in mangrove forest, although their occurrence in this forest type probably depends on proximity to other, more favoured habitats. 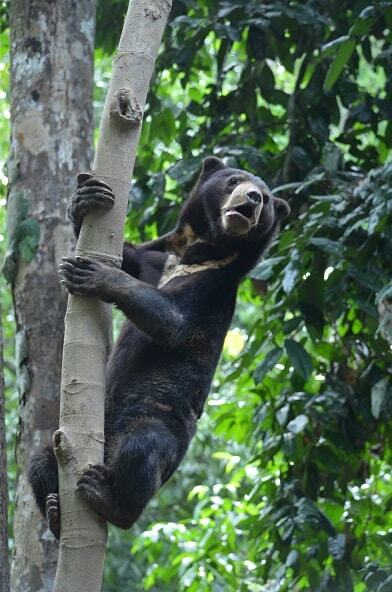 Interestingly, sun bears also like selectively logged areas and oil palm plantations near forest edges. They are most common in lower elevation forests. Little is known about the behaviour of sun bears. 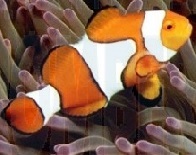 Except for females with their offspring, they seem to be solitary. They may congregate to feed from large fruiting trees, but this behaviour appears to be rare. 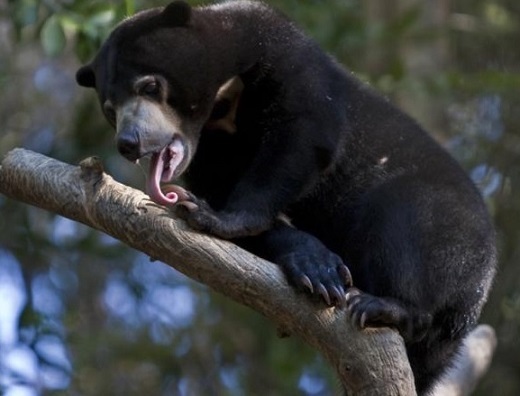 The sun bear has also been known to destroy coconut palms and cacao trees on plantations. Sun bears are nocturnal and are therefore more active at night, resting during the day on low tree branches. Sun bears are omnivores, feeding primarily on termites, ants, beetle larvae, bee larvae and honey as well as a large variety of fruit species, including coconuts, bananas and especially figs. Occasionally, growth shoots of certain palms and flowers are consumed, but otherwise such food items rarely occur in the diet. 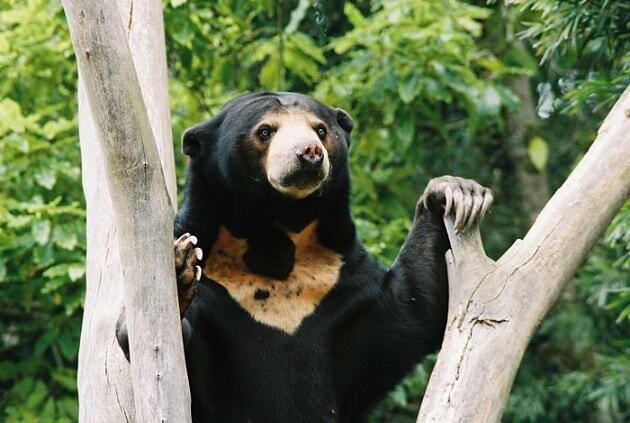 The sun bear's fondness for honey gives rise to its alternative name, 'honey bear'. In Malay and Indonesian, it is known as 'Beruang Madu' which translates to honey bear. The sun bears' powerful jaws can crack open nuts and its long, powerful claws are used to break into tree trunks and fallen logs to access honey, termites and assorted invertebrates. When eating termites, sun bears thrust their paws into termite mounds and lick the termites off their paws. Sun bears have been observed to eat over 100 insect species and over 50 plant species. Much of the sun bear's food must be detected using its keen sense of smell, as its sight is poor. As sun bears live in tropical regions with year-round available food items, they do not hibernate and can reproduce all year round. They are pregnant for approximately 96 days after which they give birth to usually one cub, but occasionally two, weighing between 330-400g - blind and hairless. Female bears use cavities of standing or fallen large hollow trees as birthing sites. As with most new-borns, the cub is initially totally dependent on its mother, weaned only after approximately 18 months. A cub will start running, playing and foraging near its mother at between 1-3 months old. Location: Sepilok, Sandakan. Located just opposite of the entrance to Sepilok Orang Utan Rehabilitation Centre. FREE admission for children below 12 years old. Public transportations are available from Sandakan town. The centre is next to Sepilok Rehabilitation Centre and the distance between town and the Centre is about 23KM. The Labuk Road Bus Company vehicles depart from the front of the Sandakan Town Council (Majlis Perbandaran Sandakan or MPS) from 6.00 am onwards but it will only stop at the junction to the Sepilok Rehabilitation Centre. You will have to walk about one and a half km in. You can also hire a taxi for a return trip. Ideally located in Sandakan, one of the second largest cities located on the east coast of Sabah, this area is popular for ecotourism. Guests are offered the opportunity to enjoy an eco-friendly environment. A culturally rich city, guests can visit the Labuk Bay Proboscis Monkey Sanctuary, Turtle Island Park, Kinabatangan River, and Gomantong Caves. Don�t forget to visit the Sepilok Orang Uton Rehabilitation Center, indeed the most popular tourist hotspot in the city! Enjoy a refreshing stroll around the resort and be rejuvenated by the fresh and non-polluted atmosphere. 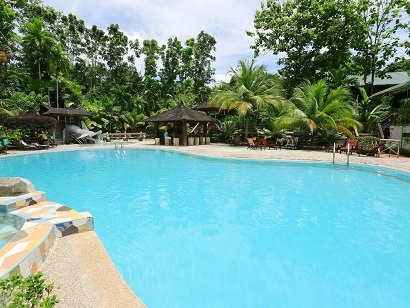 Apart from being a nature paradise, Sepilok Jungle Resort boasts 45 air conditioned rooms and 15 fan rooms ranging from dormitory to deluxe with a balcony. A perfect place for nature lovers, Sepilok Jungle Resort is simply unique.